Before Charlie Sheen made #tigerblood one of the most trended topics online the only association we had with it was the real thing. Now however social media (or media in general) has made us wonder; what exactly is #tigerblood? There are lots of speculations as to what exactly it is Charlie Sheen is drinking these days, whether it is real tiger blood or as some reported, Xango Juice which is made from mangosteen juice. 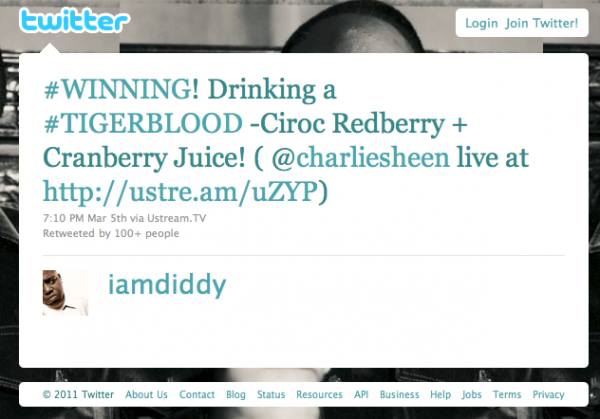 What is more interesting though is the popularity of alchoholic cocktails popping up named #tigerblood. Diddy was among the first to use #tigerblood to promote his own Ciroc vodka brand by tweeting the below recipie. We however want to find the best #tigerblood recipie, so please send us a tweet @digisquared with your best #tigerblood recipie, or leave a comment below with your suggested drink recipie. We will come up with something cool for the #winning recipie!